Anyway, I should stop thinking about it, before it gets in my mind too much and the cravings strikes again. It’s still one more week in front of me after all. But I feel good. I’m not gonna make a summary about my mood, because that still changes every day, being more dependent on the fact that I’m not working and we can’t find an apartment, than on the diet I think. But I have pretty steady energy and (except the camping) very good sleep everyday now. That’s definitely very positive. My love for everything from one bowl again. 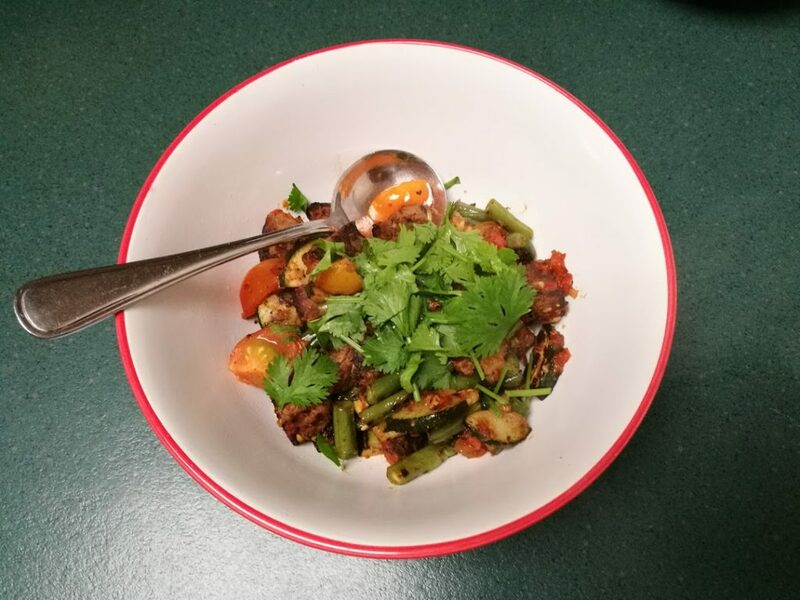 If you are following me a little bit, you could probably notice that as much as I love to cook, I love to do things easy. At least most of the time. And breakfast hash certainly falls under easy meal category for me. I’m usually just too hungry in the morning to spend too much time with brekky prep. Do you also have it this way? Or are you more patient in the morning, setting yourself a fancy breakfast? Anyway, this morning I had a different reason (apart from my laziness) for a quick easy breakfast. It was because I didn’t wanna be late for a coffee date with an actual human being. I was talking to a real person today. Being social and all. Crazy, right? I can’t believe myself. Well, I was a bit awkward, as it takes time for me to get comfortable around new people, but I enjoyed it. Because we seem to have few things in common, like the urge to escape to the nature every now and then and also the deviation for boxes. I’m not alone in that one, James! I actually hope that it wasn’t the last time I had coffee with this great girl. Well, she reads this blog, so she probably knew that I’m bit different beforehand anyway. And it’s all thanks to the Whole30. Because of the diet we are in a same Czech Facebook group. And in this group we found out, that despite the fact that we are from Czech Republic, we both live in Australia. And then against all the odds, we live in same city! So even if the Whole30 doesn’t do any other magic to me, there is already a one great thing about it. It brings people together. Because I also had some shopping to do after the coffee, I came home bit after lunch time, already super hungry. But at this point I’m thankfully quite educated in the importance of having a quick food on hand all the time on the Whole30. 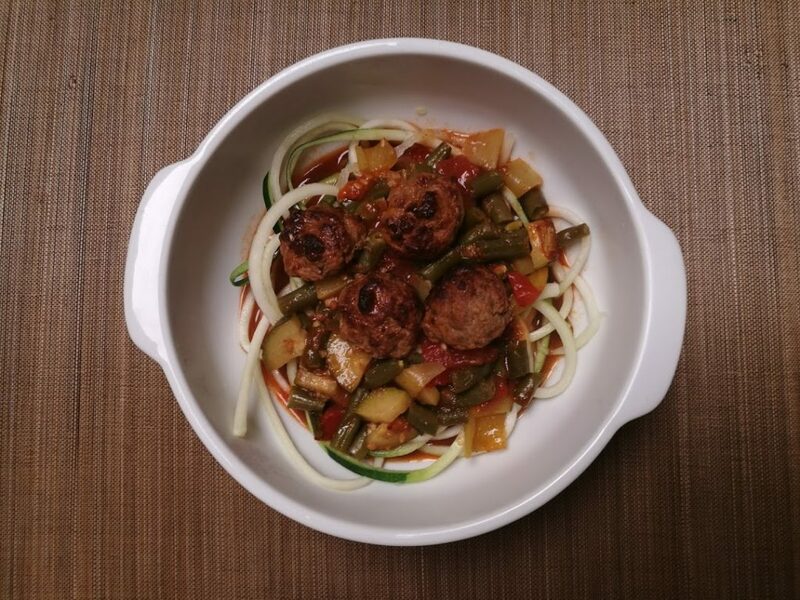 So I just cut some veggies and threw them together with meatballs from the freezer into a baking dish, pouring tomato sauce over it, serving everything over zucchini noodles half an hour later. Easy peasy lemon squeezy. Oh, dinner was a bomb. And I didn’t have to make it. So a double bomb. 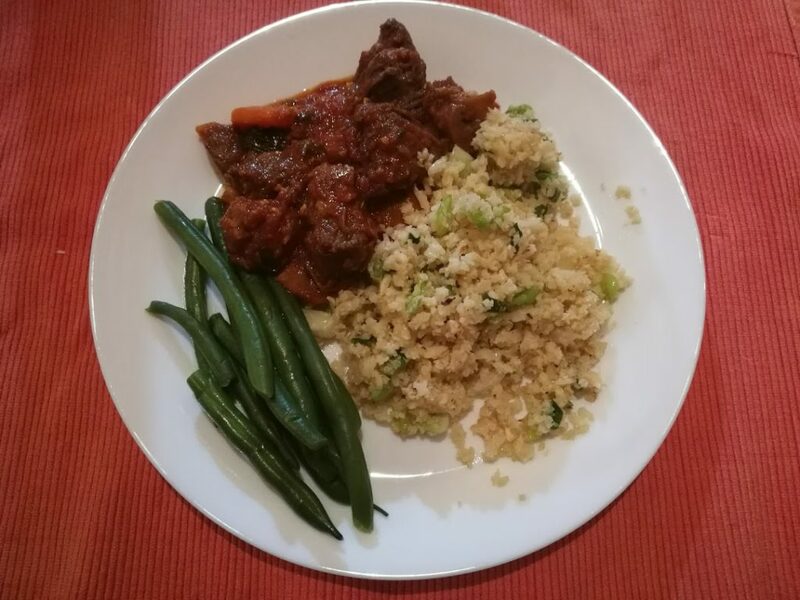 Beef casserole with green beans and fried cauliflower rice. Amazing combination! I honestly couldn’t care less that others had it with a pasta too. Not even a blink of the eye. It was just a perfect finish of the perfect lazy day. Although I think I used the acquired time quite wisely and finally caught on my blogging delay and wrote the journal from Day 23 as well as today’s. So now I just have to post the promised Ajvar recipe. Dagmar, my wife, Rosemary just loves to cook, bake – anything to do with food & trying new recipies. You two should meet up real soon! Love your daily ramble.